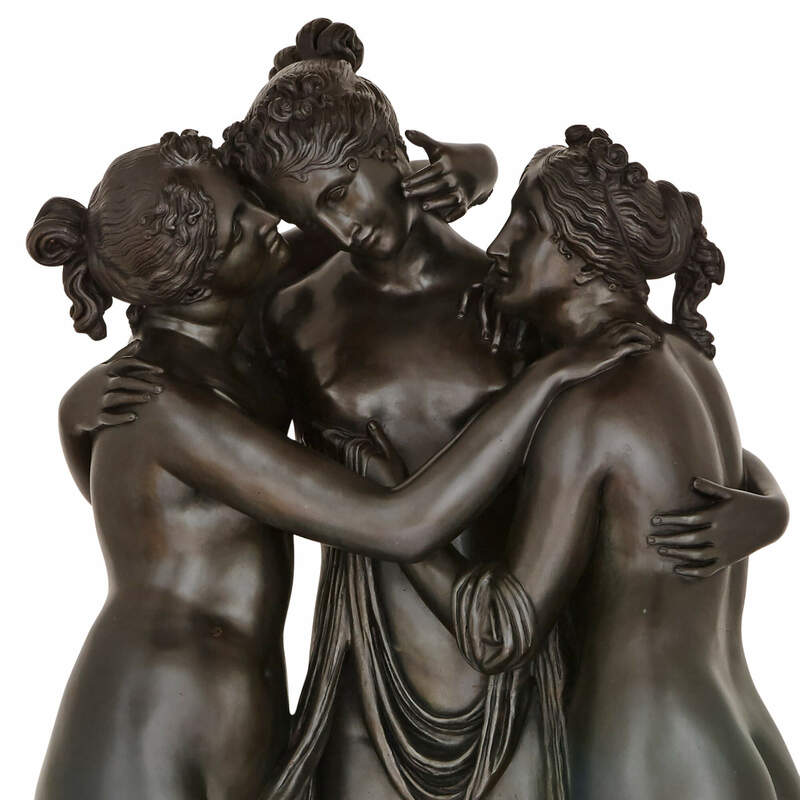 This extraordinary life-size bronze sculpture of the Three Graces is a stunning replica of Italian sculptor Antonio Canova's Neoclassical masterpiece. The Three Graces of Classical mythology have formed the subject matter for a number of important Renaissance and Neoclassical pieces of art, including works by Botticelli, Rubens and Antonio da Correggio. 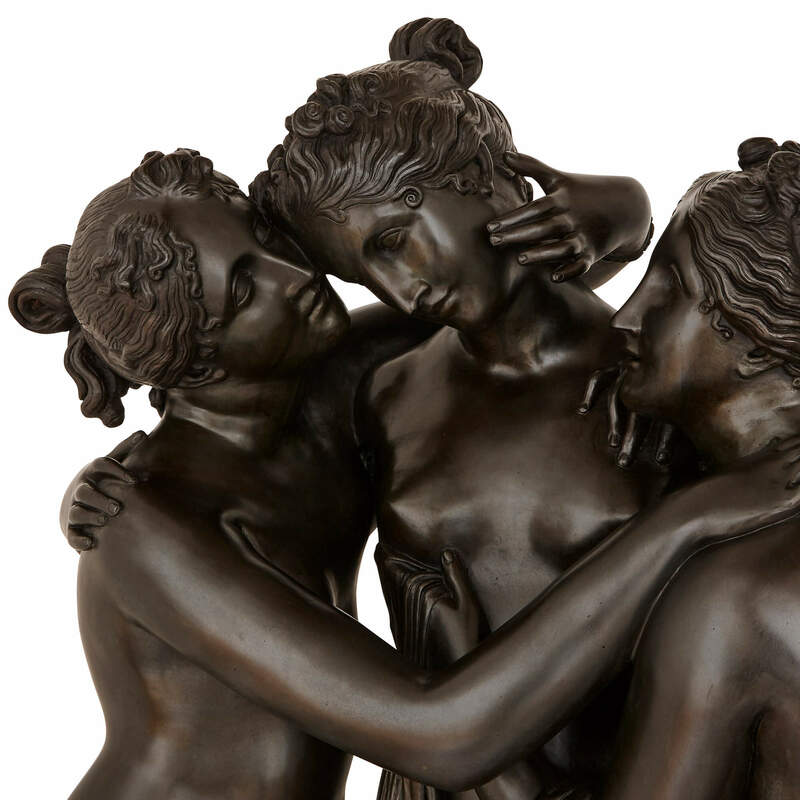 In Classical antiquity, the Three Graces, also sometimes known as the Charites, were said to preside over important festive gatherings, making this piece ideal for a Neoclassically-inspired dining room or banquet hall. They were supposedly the daughters of Zeus, and together represented the 'graces' of beauty ('Thalia'), mirth ('Euphrosyne') and elegance ('Aglaea'). Perhaps, however, the most famous depiction of the Three Graces in Western art is the marble sculpture by Neoclassical master Antonio Canova (Italian, 1757-1822). Canova completed two versions of the marble in the 1810s: one for the Empress Josephine, wife of Napoleon I, and another for the English nobleman John Russel, 6th Duke of Bedford. The first version can today be found in the Hermitage Museum, St Petersburg, while the second version is held jointly by the Victoria & Albert Museum and the National Galleries of Scotland. There are small differences in details between the two sculptures: this bronze group takes after the V&A's version. 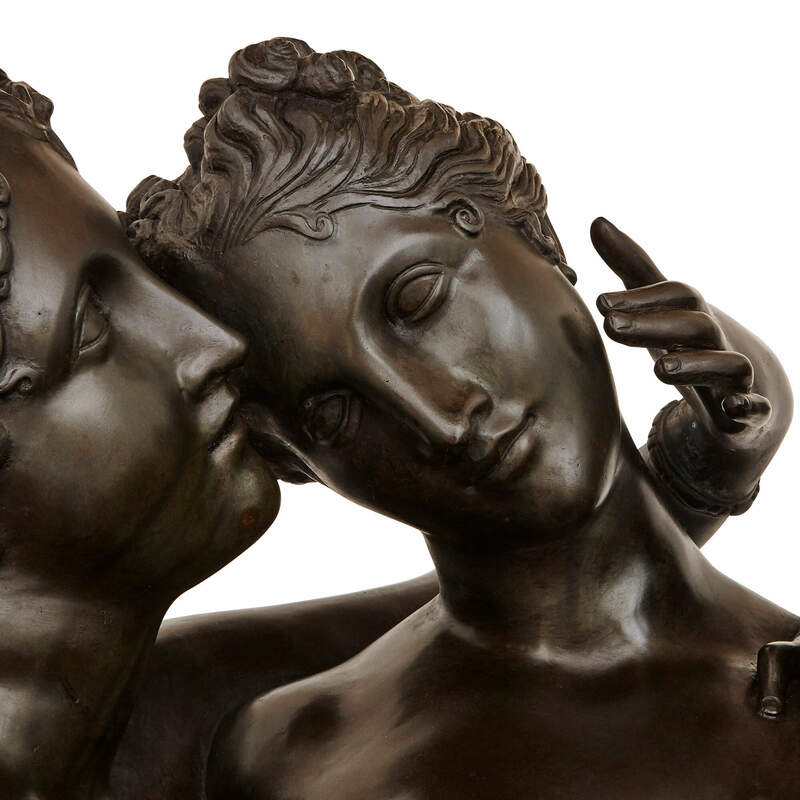 The original sculpture was instantly recognised by Canova's contemporaries as a masterpiece of the new Neoclassical style, of which Canova was regarded as the leading practitioner. The lightness of touch and the soft flesh of the figures were details which were particularly lauded. A number of copies were completed throughout the 19th and 20th Centuries, in varying sizes and materials, largely intended for the domestic luxury market. This life-size bronze group was cast by the Fonderia Versiliese, an important Italian bronze foundry who are most notable for having cast the famous sculptures of Fernando Botero, (Colombian, born 1932). 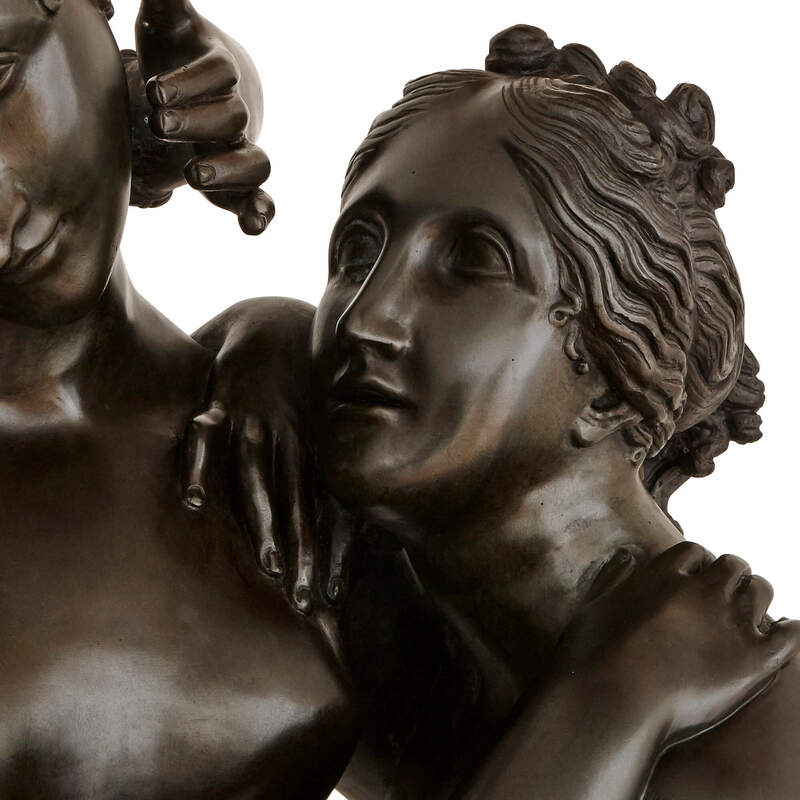 This bronze measures 180cm in height, and represents a faithful handling of Canova's original. The bronze is also especially notable for its rich, dark patina.